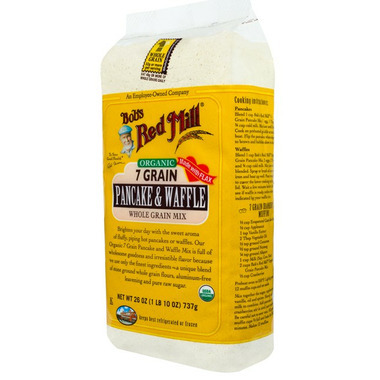 Bob's Red Mill Organic 7 Grain Pancake and Waffle Mix is full of wholesome goodness and irresistible flavor because Bob's Red Mill Organic 7 Grain Pancake and Waffle Mix uses only the finest ingredients. 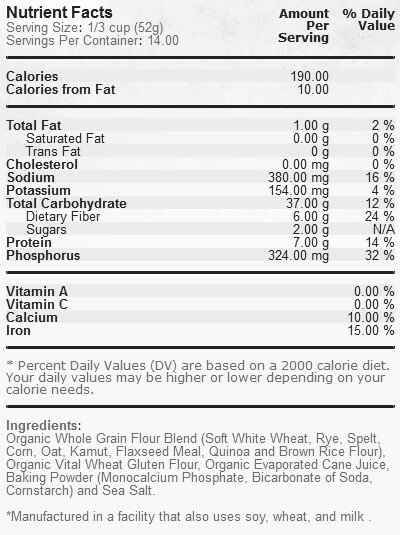 Ingredients: Organic Whole Grain Flour Blend (Soft White Wheat, Rye, Spelt, Corn, Oat, Kamut, Flaxseed Meal, Quinoa and Brown Rice Flour), Organic Vital Wheat Gluten Flour, Organic Evaporated Cane Juice, Baking Powder (Monocalcium Phosphate, Bicarbonate of Soda, Cornstarch) and Sea Salt. Delicious and healthy! For my kids I mix in raspberries or chocolate chips, it makes it a bit more interesting. Does taste like whole wheat. Sure you can make your own, but I like to have a multigrain pancake, and this saves the time of blending flours. My kid and I love it. So easy, so good. Since becoming a mama time is of the essence. Having Bob's waffle and pancake mix in the house means I have the time to make waffles any day and not just Sundays. It also ensures I have all the ingredients on hand and ready to go. It is a no fail mix. add an egg, add some milk and you're ready to make pancakes. my family loves them. very yummy!! very easy to make. i also add some banana sometimes, or cacao powder, or flax seeds. super-tasty!! !